Wildlife Spotting at Sea - from sharks to eagles, keep those cameras close! Wildlife is a huge part of our voyages. Whether you join Bessie Ellen in St. Kilda, Scotland, or the Eye of the Wind in the Caribbean, there’s always plenty to spot. Discover what to expect from different destinations – whatever the journey, a pair of binoculars and a camera are packing essentials! Most of our Scottish voyages are touring the Outer Hebrides, and even making the journey to St. Kilda a couple of times a year. It is not unlikely for dolphins to follow you on your voyage, leaping and diving in and out of the water alongside the boat, and if there are rocky outcrops or secluded beaches around, make sure your eyes are peeled for seals too. As your ship gets closer to land, have your binoculars at the ready as there are often red deer grazing the coastline of some of the more uninhabited islands. Our Scottish voyages also offer a good chance of meeting a puffin colony – especially earlier in the year when it is their breeding season. If you get really lucky, there are a few once-in-a-lifetime wildlife watching chances. Golden Eagles soar through the skies of Scotland, while whales frequent the waters. Humpback, Minke and, if the odds are in your favour, you may well be able to catch a glimpse of a killer whale. There is a small community of 7 Orcas in the Western Islands of Scotland – so when you near the Small Isles on a still, calm day, look out for their dorsal fins gliding through the water. Cornish waters are abound with marine life, from sea bird colonies like guillemots and razorbills to seals and porpoises. Look closely and you may see a hug dorsal fin slicing through the water toward you – but don’t panic, Cornwall is home to a large number of Basking sharks that are of no threat to humans, but make for great wildlife viewing. You should also watch out for the incredibly odd-looking Sunfish, that often bob to the top of the waters and lie flat, catching the suns rays. During Summer and Autumn, whales arrive in Cornwall, feeding off the huge numbers of fish that follow the plankton to our waters. Minke, Sperm and the second largest species of whale in the world, the Fin whale, all cruise through Cornish waters. We also have large numbers of Leatherback Turtles that visit the Cornish coast but they’re a tough spot so keep your wits about you! Whales and dolphins are abound in the Canaries, and none are more easy to find than the Pilot whale. Not a true whale, but a species of dolphin, these quiet and gentle mammals are easy to spot in the calm waters under Tenerife. As you set sail, the whales come close to the ship in large pods of up to 20. They float or “log” on the surface in these groups, diving up to 2000 ft to feed on squid that live at great depth. Other whales of the larger species can be found to the south of Gomera and include Brydes, Fin and Sperm whales. 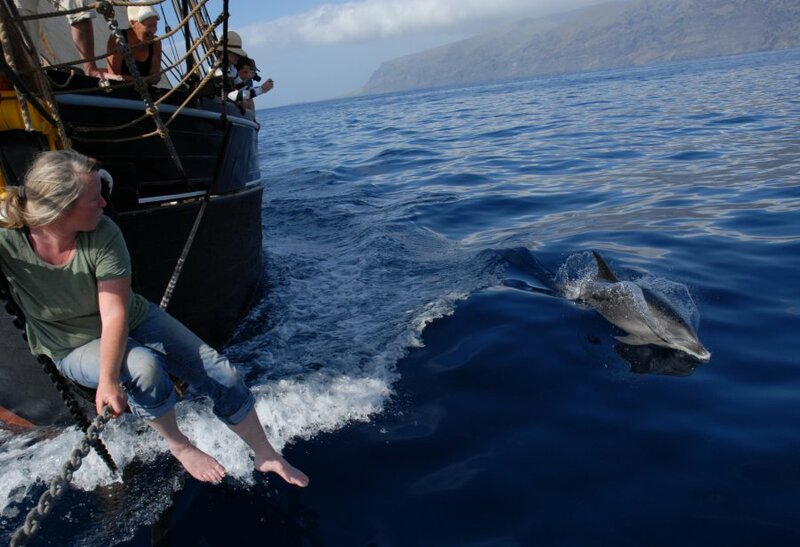 Supper happy dolphins are easier to spot, the playful bottlenose form groups around the Masca cliffs, providing a great chance for you to photograph these incredible creatures in still, crystal clear waters. Spinner and Atlantic spotted dolphins tear out of the waves alongside us as under full sail you will reach up to 9 knots between the islands. The islands shelve very quickly into the sea and provide little in the way of snorkelling reefs, but there are a few spots to spend some time drifting on the swell, watching jewelled fish swim along the white rocky bottom. If you are lucky, there are some spots where you can swim with manta ray and turtles. Dolphins, turtles and humpback whales regularly frequent Caribbean waters, alongside reams of tropical fish – making for astonishing snorkelling. Of course, there are hundreds of species of birds all over the Caribbean that are often difficult to miss thanks to their bright colours. Sharks also glide through the Caribbean reefs, so look out for the harmless Nurse shark, and the Blacktip reef shark. The reef sharks are timid, but are the second most common shark in the Caribbean and are often spotted by divers and snorkelers – however they are totally uninterested in humans!